The Fast Find 220 is a lightweight, palm sized unit designed for those of you who travel to out of the way places to give you peace of mind if you find yourself in an emergency situation with no other form of communication. On activation it will transmit your unique ID and precise GPS location on the 460MHz frequency to Search and Rescue satellites, alerting rescuers in minutes and giving them regular updates on your position. The unit also transmits on 121.5MHz frequency so you can be pinpointed by rescuers. 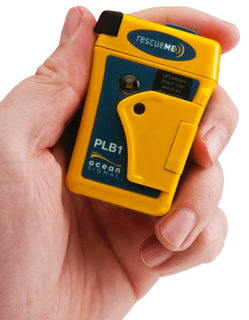 Wherever you are, at sea, on land, the rescueME PLB1 provides the reassurance that global emergency services can be alerted by the press of a button. The rescueMe PLB1 can be operated with a single hand in even the most challenging situations. A simple spring loaded flap covers the activation button preventing inadvertent use.